While on a road trip this weekend to visit family, my husband and I stopped at a convenience store where, as always, I looked to see if there were any new bottled teas I might try. 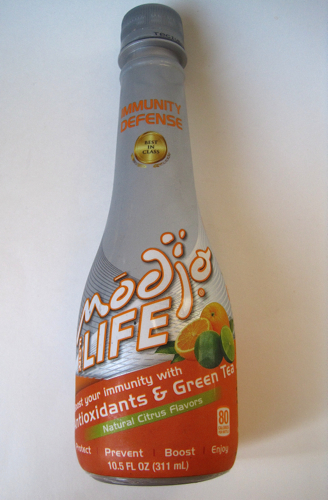 The one I got this trip was this Modjo forLife Immunity Defense drink. 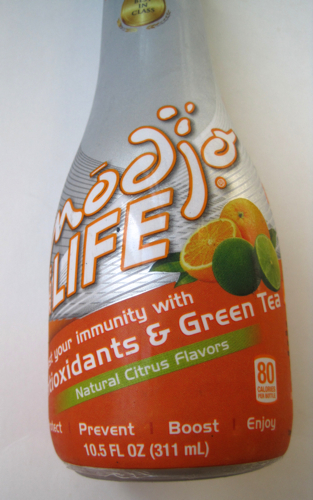 It caught my eye with the words "antioxidants and green tea." Naturally, I had to try it. 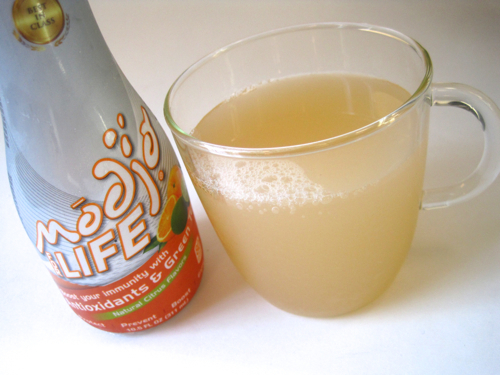 Now I must say that this naturally citrus-flavored drink was not at all what I was expecting — a thin, green-tea type of beverage — but instead it tasted like a light grapefruit-and-orange juice blend. I was amused to note that the single-serve, 80-calorie drink contained 1250 percent of the suggested daily value of Vitamin B6. So I'm good 'til about what, June? I'm always happy to see the health benefits of tea being promoted, and I very much enjoyed this drink, even though at $2.29 a bottle I won't be chugging it very often! A gift of "Vintage Cakes"
Some things are just meant to be. 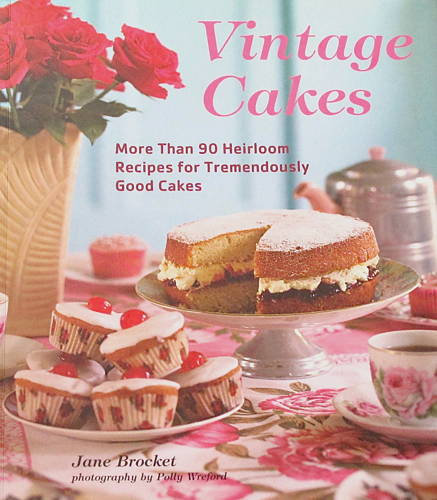 About a month ago, I spotted this book, "Vintage Cakes" by Jane Brocket, at a Tuesday Morning store, but I told myself no, I don't have room for any more cookbooks, and I wouldn't even let myself look inside. A few weeks later, I saw the same book at Ollie's in Carrollton, but again, I exercised restraint as I thought of that pile of books I'm trying to whittle down. Last week, I was meeting a friend for lunch, and she walked into the restaurant with this book and handed it to me. "Do you have this?" she asked. I just grinned and said no. She said it reminded her of me so she got it for me at Ollie's in Newnan. So I can only assume I was meant to have this book! 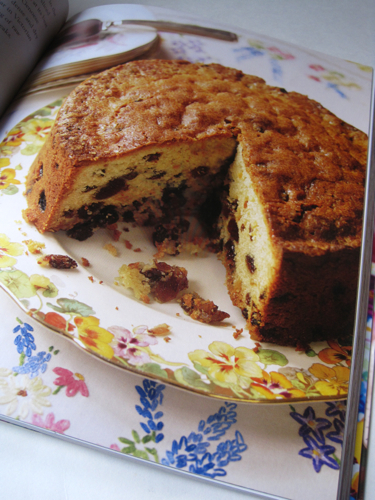 When I looked inside, I realized this is much more than just a cookbook of vintage cake recipes. 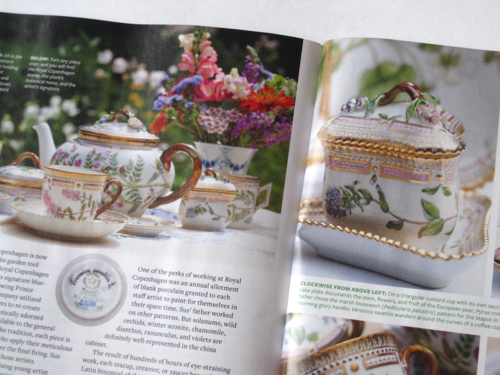 It's also a visual feast, and those who love pretty china will find much eye candy inside. 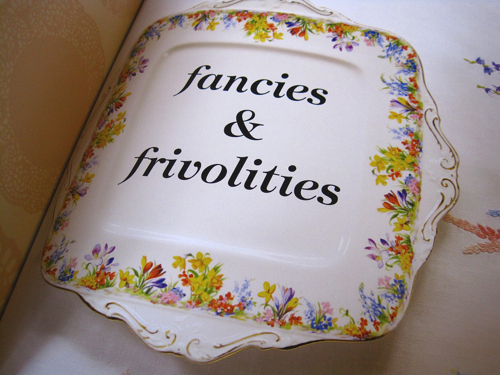 I especially loved the plate on this chapter's title page. Any idea of the pattern? With all those jonquils, it just screams spring to me, and as a friend of mine says, I'm pretty sure I'm going to need this in order to live a normal life. I found myself ogling the plates and linens as much as the food, although this yummy looking Genoa Cake is now on my to-try list. 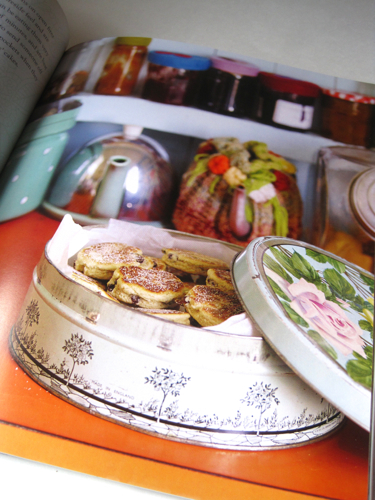 I love that these Welsh Cakes are stored in a lovely vintage tin, and I also enjoyed spying the teapots in the background. So what did I make for my first cake from the book? 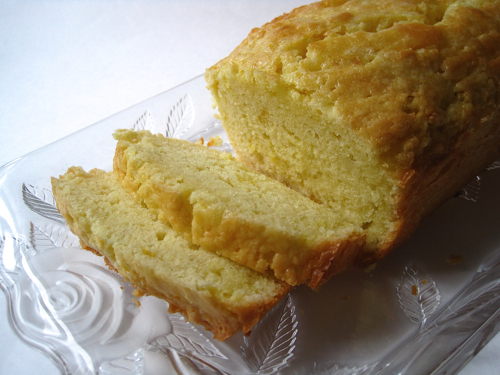 This easy and exceptionally delicious lemon-flavored Madeira Cake, which my husband just raved about. 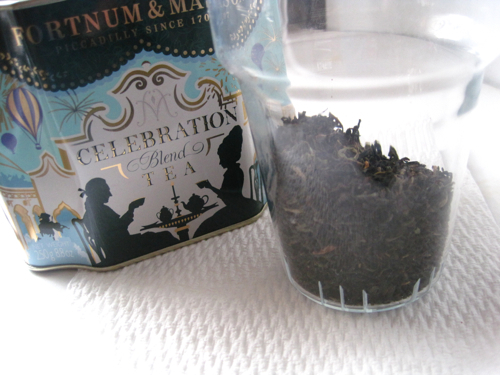 I like it because it's a perfect treat for teatime and will pair well with any number of teas. The book's author is British and uses some British terms (but not British measurements), so I thought I'd share the recipe as I made it. Preheat oven to 325 degrees. 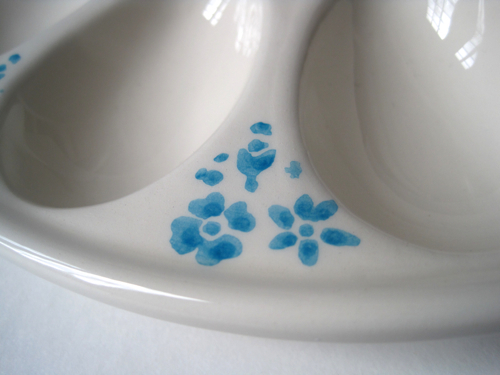 Prepare a 9 x 5-inch loaf pan with baking spray and/or parchment. (I used parchment alone and it was fine.) In a large mixing bowl, cream the butter and sugar with a wooden spoon. Add eggs one at a time, beating after each addition. Next, sift the flour and baking powder together into the bowl. Add lemon zest, and use a large metal spoon to combine all ingredients. Pour batter into prepared pan and bake for 55-60 minutes or until a knife comes out clean. Yields 1 loaf. We all have that one friend who makes us wonder why on earth we keep them around. Mine is Judy. This morning, Judy and I were out junkin’, hitting the local estate sales. We’ve been junkin’ buddies for years, and each of us knows exactly what the other is looking for. One of the best estate sales on my list was about thirty minutes away, so I picked up Judy at seven a.m. sharp. Judy’s problem is that she doesn’t have a filter. She never thinks about whether or not it’s appropriate to say something. If the woman thinks it, she says it. Period. Judy’s kids gave her a Kindle for her birthday last week, and now she won’t go anywhere without it. Judy has never been on social media before, and her kids signed her up on Facebook. I could absolutely kill them. “I don’t want to hear about hemorrhoids from the Middle Ages this early in the morning,” I said. Actually, I didn’t want to hear about them anytime. We rode in silence for a blessed fifteen seconds before she was at it again, scrolling through Facebook on her Kindle and laughing. I wasn’t about to ask what she found so funny. “These dancing orangutans are cracking me up,” she said. “Uh-huh,” I said, not taking my eyes off the road. “No, seriously. Look at this video.” Judy shoved her Kindle on top of my steering wheel. A few minutes later, she moved on to another topic. Judy collects Buttons and Bows Depression glass—the pink but not the iridescent—and is always looking for new pieces. If I could distract her with that, maybe she would quit obsessing over random posts on Facebook. To my amazement, she turned off the Kindle and reached into her pocketbook for a small notepad. I nodded. I spotted a sign for the estate sale and turned down a side street, parking a few minutes later. Only a few cars were there, but it was time to go ahead and claim our numbers. The folks who run the estate sale give us a number in the order in which we arrive, and then at opening they let us enter a few at a time. We were number eight and nine in line, so we’d likely be part of the first group to enter. At eight on the dot, they waved us inside. I glanced at the living room and walked past, headed for the kitchen. Judy did, too, because that was where we usually found Depression glass and teawares. I saw a counter stacked with pink glassware and hoped Judy would find some items she wanted. The open cabinet doors revealed a display of teapots. I was excited to see a pink Aladdin teapot, which had long been on my wish list. It looked great. I ran a finger around the lid, spout, and base but couldn’t feel any chips or cracks. The teapot was marked eight dollars, so it was definitely going home with me. Surprisingly, Judy and I were the only ones in the kitchen. “Any Buttons and Bows?” I asked. “Just nabbed this vegetable bowl and two sherbets,” she said, holding up the pieces in triumph. Judy scanned the rest of the kitchen but didn’t find anything else she wanted. She said she was taking her glassware to the checkout table so the gals there could go ahead and box it. Then, she said that in the preview pictures online, she’d seen some old costume jewelry they had for sale, so she was going to check that out while I continued looking at vintage Pyrex dishes. Those small refrigerator dishes were quite fetching, and I’d been thinking of collecting them. Within minutes, Judy returned and held out her hand. I was afraid she’d gotten out her Kindle and had something for me to view on Facebook. 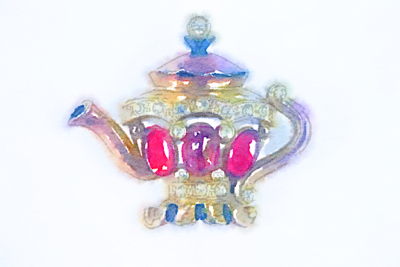 Instead, it was a rhinestone pin in the shape of a teapot. “Thought you might like this,” she said. Judy beamed like a proud mother. And it was. The pin was a little loud for my tastes, a little gaudy, and a little tarnished—kind of like Judy, now that I think about it. But I believe I’ll keep them both. Sports advertising is a topic I’ve certainly never thought of in light of its tea connection — or at least I hadn’t until I read an article in the Spring 2015 issue of the Upton Tea Quarterly. When I think of sports advertising, I think of those ridiculously expensive Super Bowl ads and, later in the year, those NASCAR name-droppings that follow each race: “I’d like to thank the MasterCard-Ford-Coca-Cola-McDonald’s-Colgate team for helping us win today …” But sports advertising has been around a long while, as this article attests. Sir Thomas Lipton knew the value of building an advertising campaign around sports, and he capitalized on his love of yachting to help grow the Lipton brand. Although he would try five times to earn the America’s Cup, he would never win, although he did gain a reputation as a good loser. When his ship Shamrock failed to win him the trophy in 1899, he commissioned the rival of that ship's builder to design the Shamrock II. The ship was tested at the William Denny and Brothers shipyard in Dumbarton, Scotland, the shipyard that had completed construction of the famous tea clipper Cutty Sark. According to the Upton article, “America did not want to lose the Cup to the British, but more than a few Americans were actually rooting for Lipton. Win or lose, his increased tea sales would more than pay for the ride.” Lipton’s ship didn't win the race, but the Upton article notes that “the almost limitless exposure given to him by the press was priceless. In a very real sense, Lipton had become a pioneer in what was later to be called ‘sports advertising.’” It’s yet another way we can very truthfully note that our favorite beverage has changed the world! 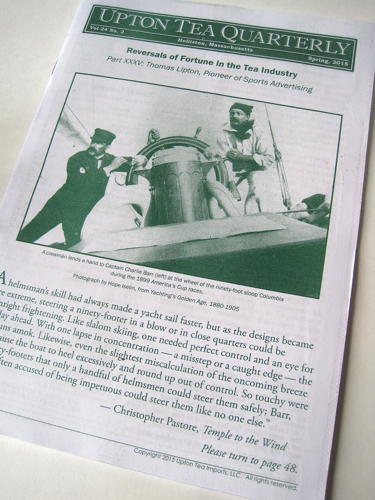 If you’d like to read the article for yourself, or to subscribe to the free Upton Tea Quarterly, click here. Friends, most of you know that I am not a complete moron in the kitchen. I have successfully made madeleines and macarons. I aced the famous Cajun roux the first time I attempted crawfish etouffee. I've made recipes friends and family have oohed and aahed over. I cannot, however, successfully boil an egg. Oh, I can cook one thoroughly enough to throw in an egg salad or potato salad, but I have never made pretty, perfectly oval hard-boiled eggs. It's my one lifelong kitchen flop. 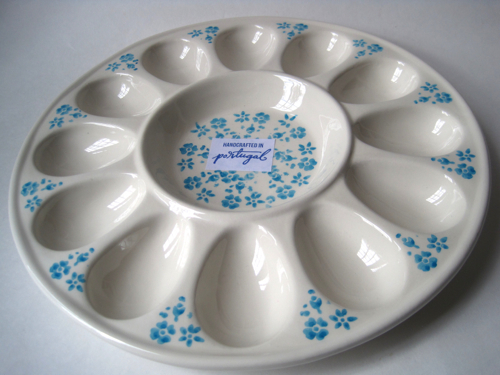 And so naturally, I bought a pretty egg plate over the weekend. 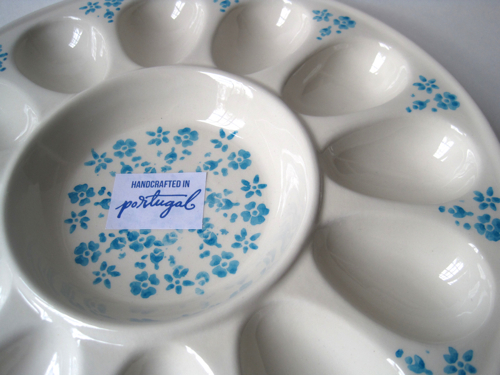 Isn't this dish from Portugal just lovely? It was a $7.99 T.J. Maxx find, and I thought it was just the thing to inspire some hard-boiled egg experimenting before Easter. I think I like this design so much because of the color and because of the fact it reminds me of old-fashioned stenciling. But today, I come seeking your help and advice. I've followed cookbook directions for boiling eggs. I've used Martha's directions for "perfect" hard-boiled eggs. I even used a dear friend's very explicit directions for boiling eggs. I've boiled them longer, shorter, with more water, with less, I've let cold water run over them, I've let them cool naturally. Still, I always unpeel them and get that ugly little square shape at the end of my eggs. If any of you can share the secret to perfect hard-boiled eggs, I'd be most grateful. 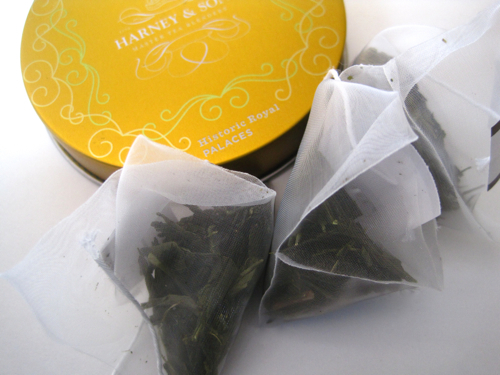 I want to try tea-dying some as well — you wondered when I'd get to that, didn't you? — but mostly, I'd just like to cook a pretty egg. Is there yet hope? Do you ever loan your teawares? I do, and the few times I've been asked to do so, I've felt very comfortable loaning them and never had so much as a smudge happen to them. 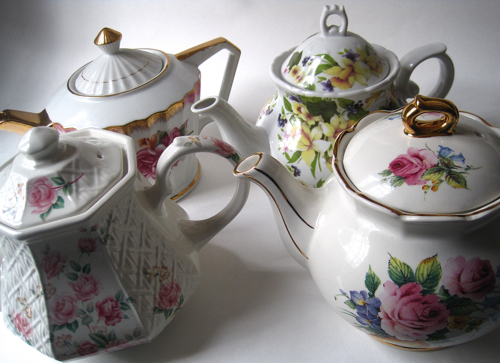 Over the weekend, a friend asked if I had two teapots I might be willing to loan her to decorate tables at a business women's luncheon next week. Of course I could spare two, I said, and because it's spring, I decided I definitely needed to send the more floral ones. I narrowed it down to these four, which I'm planning to drop by her office today. 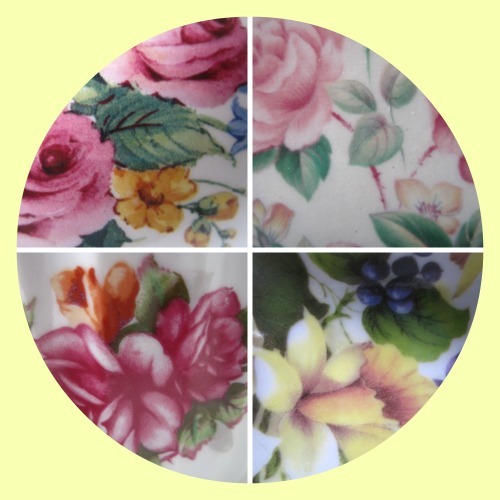 Here are some details of the patterns on the four I selected. I think most of you understand when I say I get so much enjoyment from the pretty designs on my teawares. Is it crazy to say this is my favorite form of artwork? And here are the four contenders in their chorus line, just waiting to see who gets selected at the audition. Number three is my current favorite of this group, so I'm curious which two will be chosen for the luncheon! This is the new glass teapot I received from my sister for Christmas. I've had it sitting out for three months now but hadn't actually tried making tea in it. Then, I saw a photo of a cute terrarium in a glass teapot and thought hey, if my new teapot doesn't strain very well, I'll use it as a terrarium. So a test was in order. 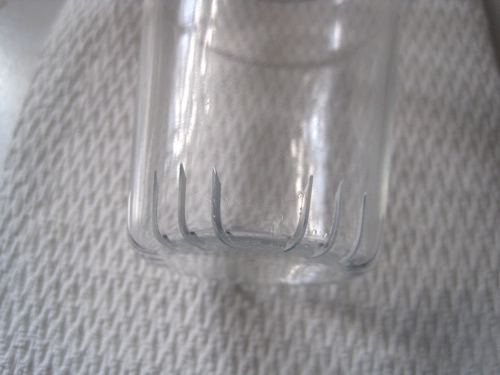 The Simax teapot comes with a glass strainer with slits in the bottom for letting the liquid seep through. Steeping, steeping, steeping. Would there be lots of little tea leaves left in the pot when I removed the strainer? Nope, just a few fannings. 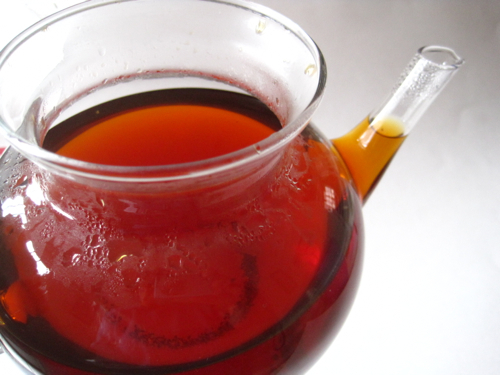 So, that's great news for preparing tea, not so great news for the future terrarium project. 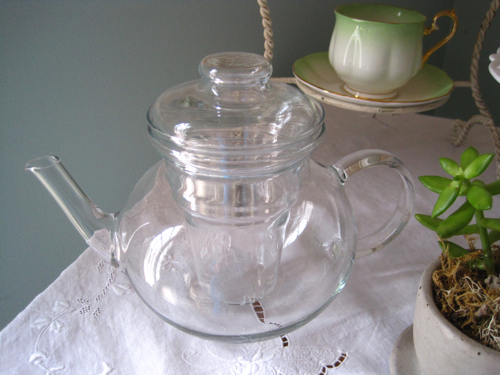 On the other hand, I do have another glass teapot that didn't perform so well, and maybe some plants are in its future! So what do you do on a rainy Sunday afternoon when you'd really rather be enjoying some sunshine? I decided it was obviously time to pull out the scrapbook I've been putting off forever and make a little progress. 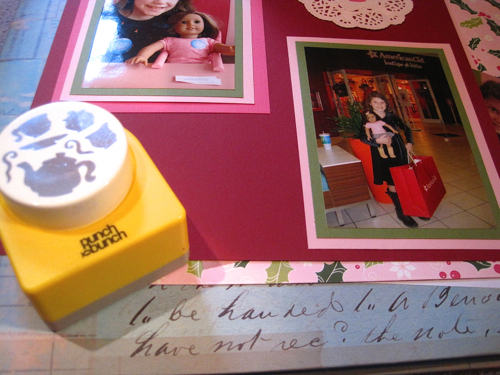 I thought I'd start with photos from the tea my niece Amelia and I went to at the American Girl Doll Store in December, and since tea was involved, I pulled out the PunchBunch paper punch I've enjoyed using for many years. … and I also added some on a strip of paper here. 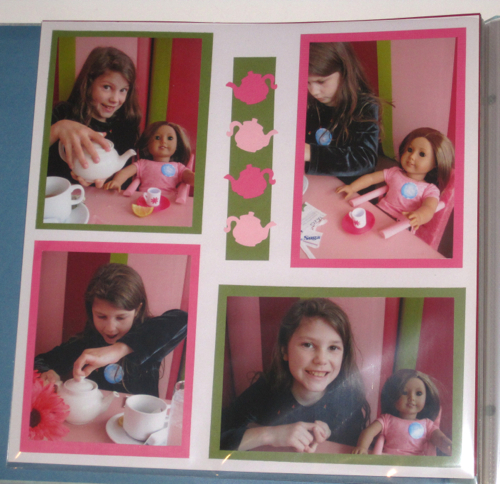 My designs are super simple at this point, and my main goal was simply to match the colors of paper to the colors of the decor in the American Girl Doll Store tea room, which I think I did. My favorite of these first three pages, though, is probably this page showing Amelia preparing her tea. It still cracks me up to see the photo at left of her adding all those packets of sugar to her tea! One other thing I wanted to mention is that the craft stores appear to be carrying some fun new paper goods these days. 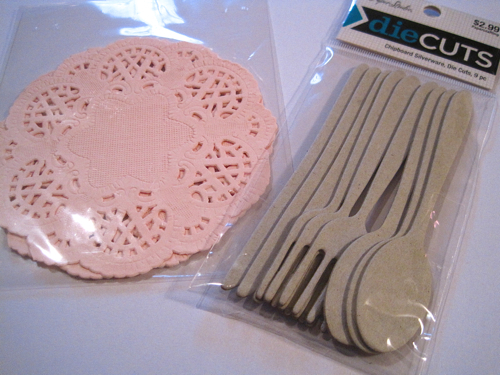 I got these miniature pink doilies and chipboard forks, knives and spoons from Hobby Lobby, and I've since seen similar items at Michaels. 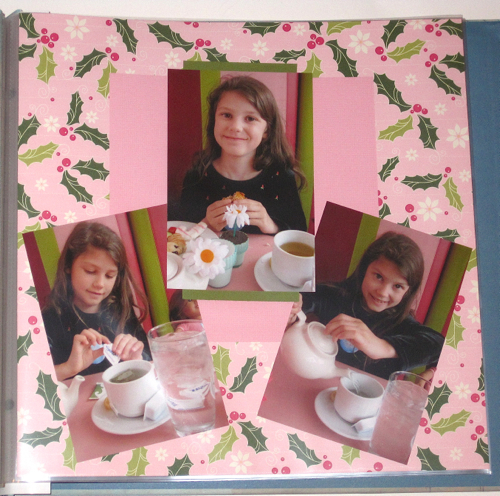 I haven't quite figured out how to attach paper to the chipboard yet, but when I do, I think it'll spruce up the pages where I actually show the foods we enjoyed at the tea. 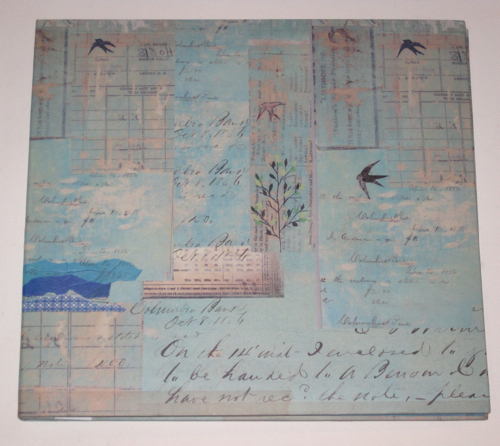 This, by the way, is the cover of my latest scrapbook album, which I found at Tuesday Morning and bought because of the pretty aqua blue color and the vintage handwriting! So, how do you spend a rainy afternoon? After enduring such a cold and wet winter, Joanne was ready to play in the dirt again. The first day of spring was one she always looked forward to, and this year she was especially eager for it. Her husband, Tom, had promised to build her a new garden shed. The two of them were in their seventies now and still enjoyed good health, so she saw no reason not to plan for the future as if she would have one. Joanne had owned garden sheds of every shape, size, and color for thirty years now, but this time she wanted a small white cottage near the edge of the woods. Tom had been collecting all the old doors and windows he could find to make it happen. He was waiting for the ground to dry out a bit before he started on the foundation, but he’d given Joanne the go-ahead to start getting plants and décor ready. In the garage, Joanne found the usual pile of garden pots and statuary that she always tossed inside at the last minute each fall. Typically, she waited for news of a freeze and rushed outdoors to collect any objects that might break. She’d learned the hard way that birdfeeders made of glass looked pretty during warm weather, but after they’d filled with water, frozen, and shattered—not so much. The all-white garden cottage had been the focus of her reading and planning all winter. She kept a notebook where she taped photos from garden magazines and listed names of plants she wanted to grow. Joanne could hardly wait to watch it all come to life. Spring was definitely the season for the world’s dreamers and optimists. Daffodils had been popping up in the neighborhood lawns for weeks, and in her cottage garden out front, the frilly burgundy foliage of the peonies was just coming up. Of course, the weeds were in abundance as well. Tom called those the zombies of the plant world, noting that you could try to get rid of them but they were indestructible and never really died. Clay pots. That was what Joanne needed, her clay pots. She loved seeing all the colorful ceramic pots in the garden center each spring, but when it got down to the serious business of potting and repotting plants, she found nothing did the job quite as well as a plain old clay pot. She pulled out a box from beneath a shelf in the garage and found a dozen or so. Good. She already knew what she was going to plant around the new garden shed this year. She would have lemon basil, French thyme, cilantro, and several varieties of mint—the mint in pots because it was so invasive and would overtake her lawn if she didn’t corral it from the get-go. Next, Joanne pulled out the box with her decorative garden pieces. The small mosaic fountain was a favorite and always created such a bright spot in the garden. The wire teapot planter had been a gift from one of her Red Hat Society friends a few Christmases ago. It had arrived with a poinsettia in it, and Joanne had often mourned the fact that poinsettias couldn’t grow outside year-round. She still hadn’t found the planter she was looking for. It had been a gift from her gardener friend Marian, and it was perhaps the most treasured pot she had. Marian had died of a heart attack two years ago, and Joanne still felt the loss deeply. The two had been close friends, talking on the phone almost every day, getting together for lunch every Wednesday, and constantly seeing each other at church. And then, just like that, Marian was gone. The two of them had talked on the phone the very morning Marian passed away, making it all the more difficult for Joanne to accept when Marian’s daughter called with the devastating news. Marian had been out separating the Siberian irises, and her daughter took comfort in the fact that at least her mother got to spend her last hours on earth doing what she enjoyed most—tending her garden. Joanne hoped she would be so lucky as to take her last breaths outdoors while enjoying the beauty of nature. Finally, Joanne spotted the earth-toned teacup planter in a box with some gardening tools she’d tucked away. 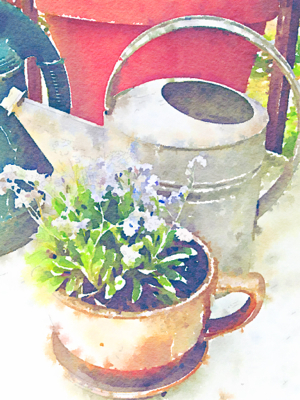 She took the planter inside the house, rinsed off the dust and cobwebs, and carried it outside to the potting bench that she was using until the new garden shed made its debut. When the little white cottage was complete and it was time to settle in, Joanne would invite a few friends over to celebrate. Marian would have been so excited about the new garden shed, and Joanne wanted her to somehow be a part of it. Now—thanks quite literally to the seeds she’d sown—Marian’s garden legacy would live on. For while Marian had preferred to call plants by the Latin name, Joanne did not. 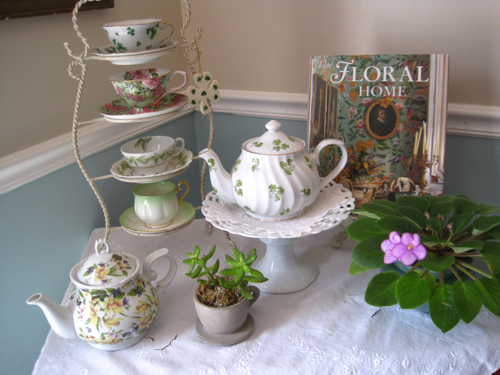 She intended to tell any visitor who asked that the sweet violet-blue blossoms in the teacup planter came from an old friend—and they were called Forget-me-nots. 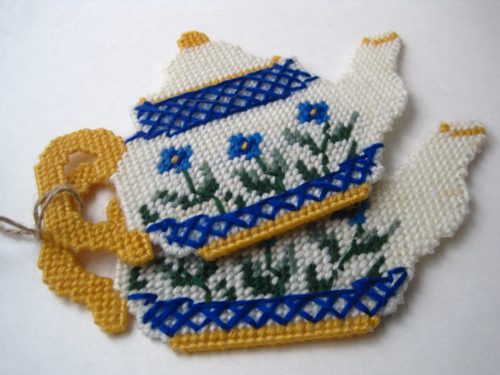 A surprise gift of teapot coasters! So Mary J. wrote the other day to say she'd seen something at an antique mall she wanted to send me. Of course I started watching the mailbox with a curious eye, and I was happy when the package arrived and inside were two adorable needlepoint coasters! I believe these are needlepoint on plastic canvas. 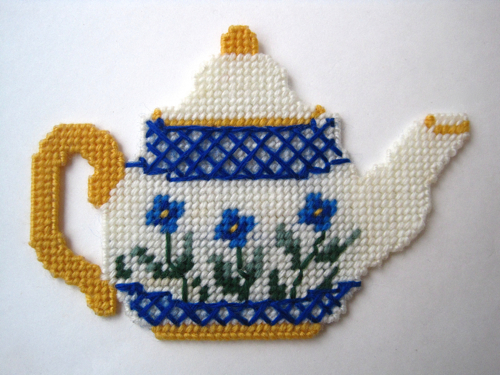 I gave up needlepoint and cross-stitch years ago because my eyes just couldn't focus on those tiny little squares as they once did, so it is *extra* nice to receive a tea-themed gift that happens to feature a form of needlework I don't do. But oh, do I appreciate the time and energy someone once put into making these lovely coasters! And they're the perfect size for using with a tea mug! Thanks again, Mary, for thinking of me — and thanks also to that unknown woman (I imagine) of yesteryear who actually made them! Barnes and Noble is very wise to display their new Harney & Sons tea tins so prominently. They have lots of lovely spring gifts out on display right now, so it was a bit of a struggle to get out the door without buying anything more than the book I went there for! 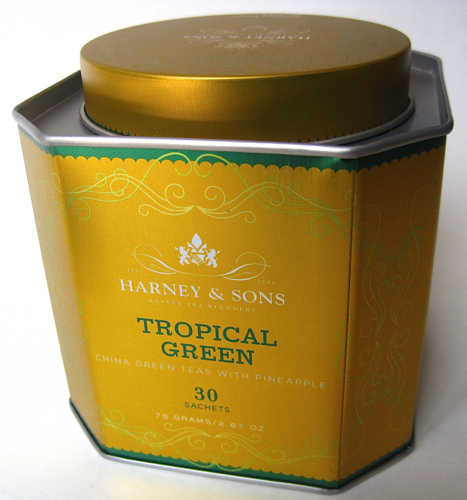 Tea *always* counts as groceries, though, so I bought a tin of this Tropical Green Tea from Harney & Sons. When I saw that this was "China green teas with pineapple," I knew I had to try it because I absolutely love the flavor of pineapple! This tea was great! It doesn't skimp on the pineapple flavor, and I also like the fact that I can see lots of green tea leaves through these tea sachets. 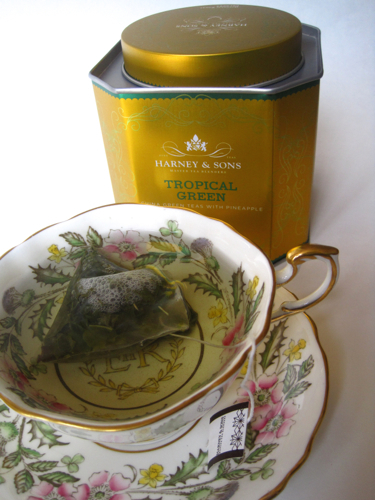 Harney has long been a favorite tea vendor and one that's always reliable, and their Tropical Green Tea is every bit as good as I knew it would be. Are you a pineapple fan? If so, have you tried this tea? The new issue of Country Gardens magazine has arrived, and there are two articles I think will be of special interest to fellow tea lovers. 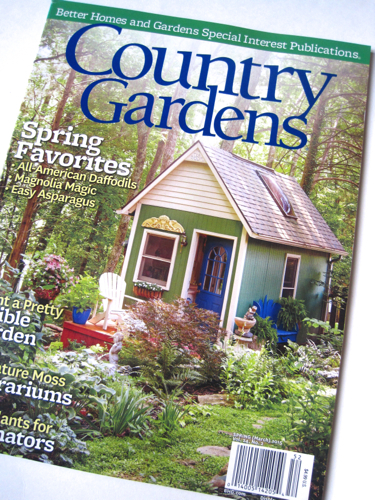 First, I always enjoy seeing the sweet garden sheds that typically are featured on the cover, but I did not realize until I read this article that the cover structure is in fact a "tea cottage." Lovely! 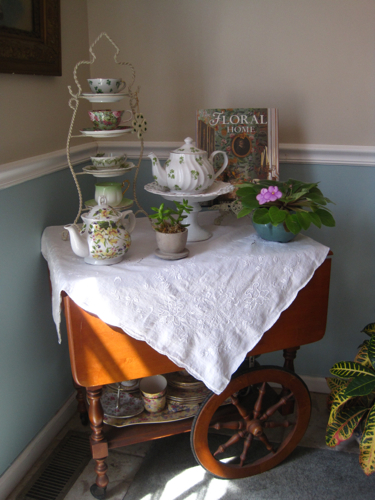 This tea cottage is in Louisville, Kentucky, so of course I'm hoping my Kentucky friend Linda will discover a connection to the homeowner and wrangle a visit so we can have a more in-depth peek inside. 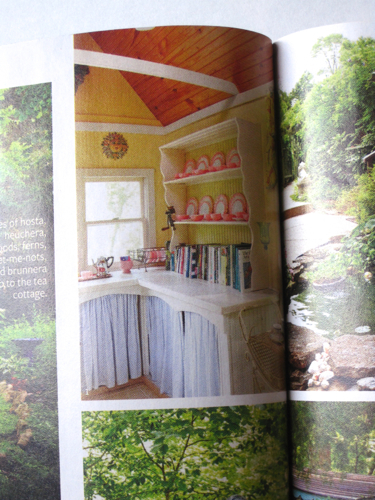 I loved seeing the pink ruffle dishes, which the article says the owner once used to celebrate her daughters' birthdays when they were little girls. The other fun article in this issue is about Flora Danica. Are you familiar with this pattern? I wasn't until I read about it a few years ago. I can't imagine I will ever own a piece, but since this tableware from Royal Copenhagen is considered the most prestigious in the world, I figured I should at least add Flora Danica to my teaware vocabulary! This article features a Maine woman whose father actually painted Flora Danica wares in Copenhagen, and I was fascinated to learn of the work that goes into all these botanical designs. The sweetest part of the story is that she didn't have a complete demitasse service and hinted that she wanted her husband to find her the missing pieces for her birthday. When the set arrived, she turned it over to find that it was signed by her late father. So if you're into tea cottages or collect Flora Danica—or perhaps you're just a dreamer like myself—this is an issue of Country Gardens you're likely to enjoy. Happy St. Patrick's Day, friends! 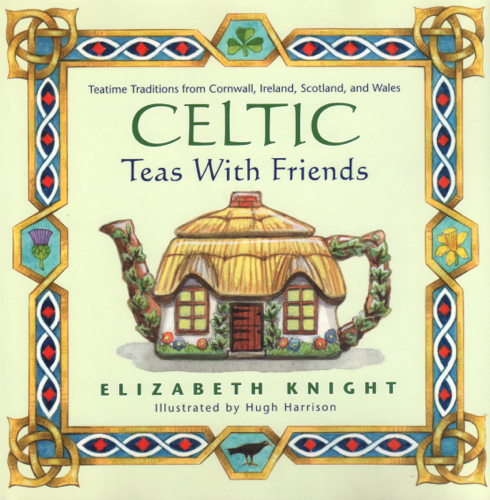 Last year I won this book in Marilyn's St. Paddy's Day giveaway over at Delights of the Heart, but only this year did I get around to reading the delightful "Celtic Teas With Friends" by Elizabeth Knight. 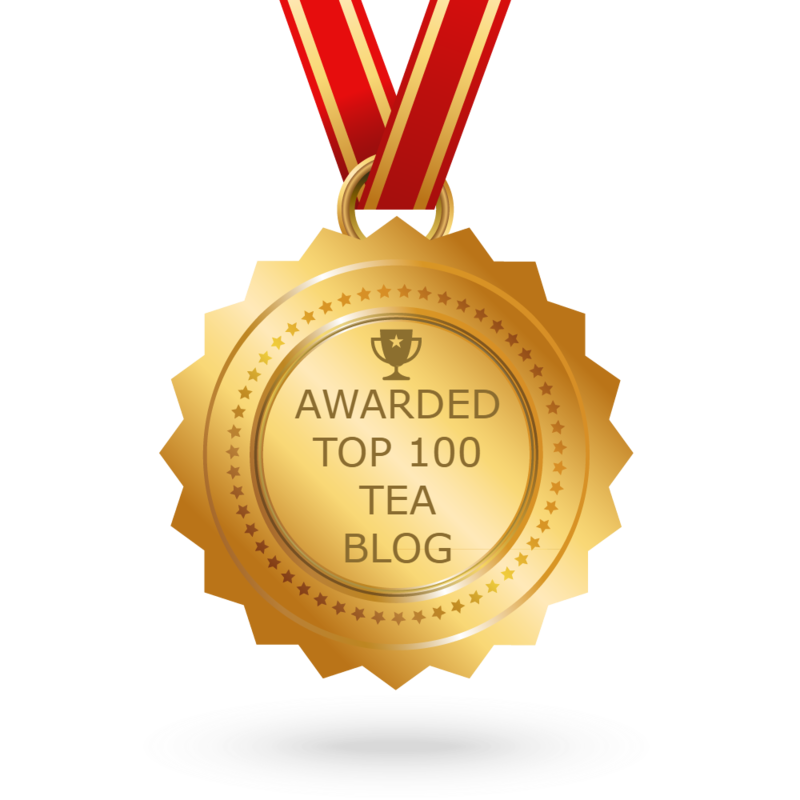 I knew Elizabeth's name as a tea professional whose books and articles I have enjoyed over the years. What I did not realize is that this book of "teatime traditions from Cornwall, Ireland, Scotland and Wales" actually features information on tea celebrations suitable for the whole year, not just St. Patrick's Day! 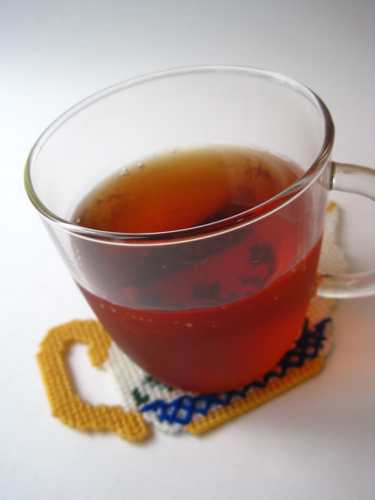 While the March 17 celebration is, of course, featured prominently, other monthly teas featured in the book include a Women's Christmas Tea, which is actually a post-Christmas event on January 6; a Gathering of the Clan Picnic Tea, suggested for Father's Day; a Sip-n-See Baby Blessing Tea in September; and a Boxing Day Tea in December. 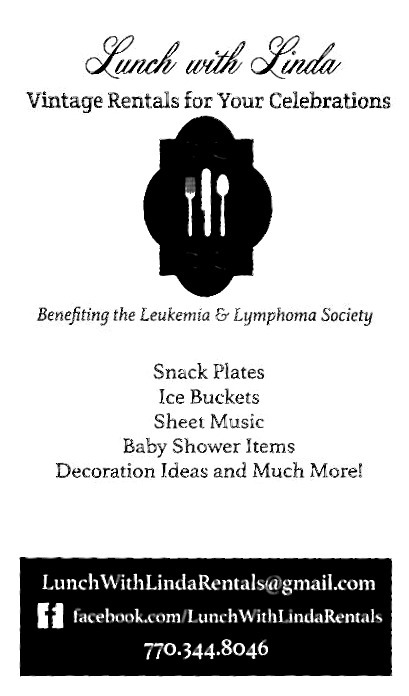 Menus, recipes and suggestions for party favors are included for each event. 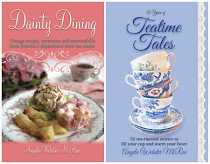 The book also includes lots of fun info on tea and teatime treats, and I was most intrigued to learn that clotted cream dates to the 13th century, and some believe that cooked cream was actually traded for Cornish tin as early as 500 B.C.! I definitely agree with Prime Minister Gladstone's description of clotted cream as "the food of the gods." If you haven't yet added this book to your tea library (and you didn't win one), I highly recommend you look for a copy of this charming book! Sandy Garvey! Sandy, if you'll send me your snail-mail address via the e-mail button at right, I'll get these samples headed your way. Congrats! When you were in school, did you always make sure to wear something green on St. Patrick's Day to be sure you weren't pinched? 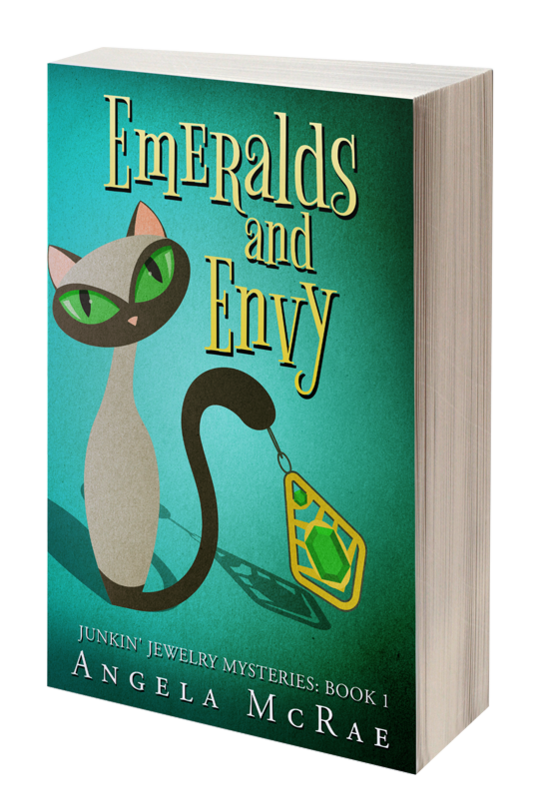 I don't know where that particular custom originated, but I do remember forgetting to wear green a few times and getting pinched, so I'm making sure to share some green on the blog in case any of you out there are pinchers! I don't have lots of green teawares, but the few greenish teacups I do have blend well even though they are very different styles! 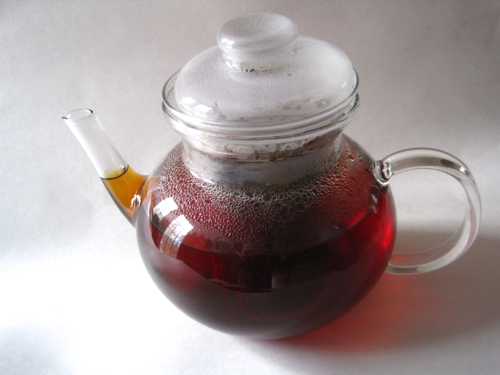 I am still just wild about the teapot I bought from a tea friend on eBay two years ago. I'd never seen one like this before, and I'm so happy to have it! 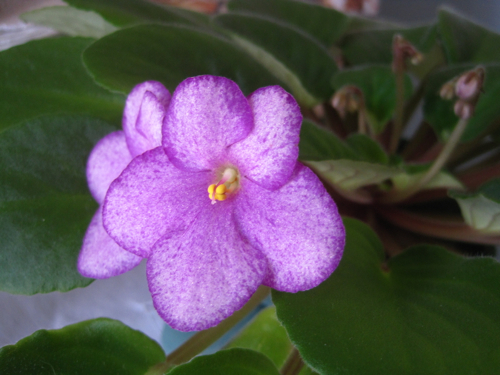 My greenery comes not from shamrocks but from an African violet that has suddenly decided to bloom. The flowers are so shimmery in the light! 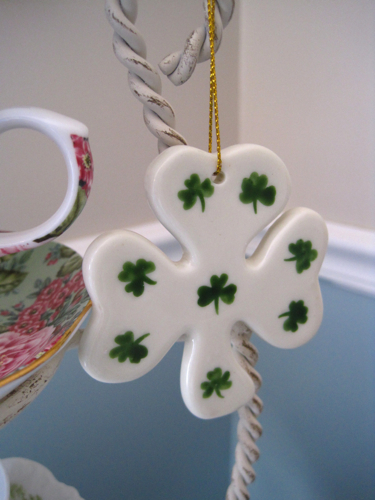 I do, however, have shamrocks in the form of this china ornament that was a gift from a friend! 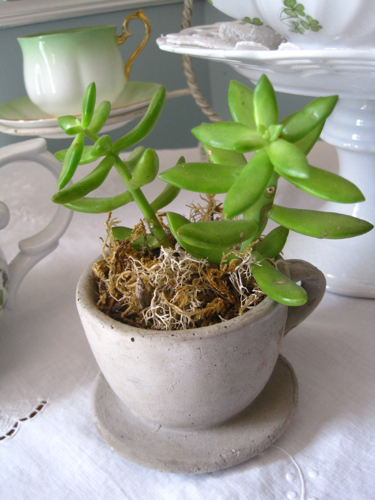 My other live greenery is this little stone-looking teacup with some sort of succulent in it, found at an antique mall a few years back and a plant that I'm pleased to report thrives on neglect. 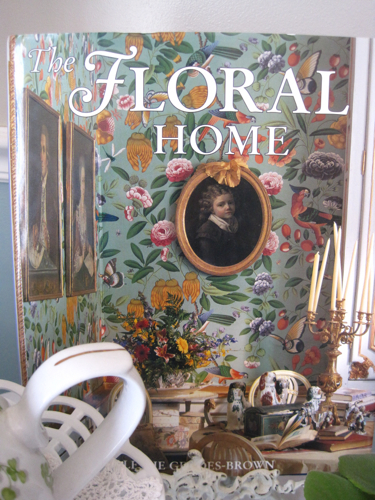 For a bit more green color, I added this book, "The Floral Home," an estate sale find. 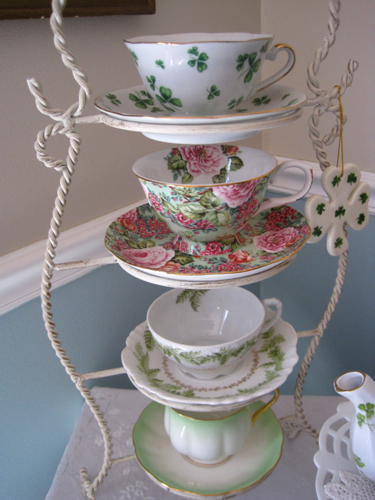 It's just a wee bit of green on the tea trolley this month, but I rather like it. Do you put out any decorations for St. Patrick's Day? Once upon a time, in the beautiful Irish countryside, there lived a handsome leprechaun named Liam. He was constantly leading friends into mischief, but he was a well-loved leprechaun nonetheless. One year as St. Patrick’s Day approached, Liam rounded up some pals and said he wanted to celebrate the holiday out of the country for a change. “Where?” said his friend Loughlin. “Why?” said his friend Leary. “My friends, we’re going to England to seek an adventure,” Liam replied. Leprechauns can time travel and do not, in fact, have to fly, but Liam and his friends could make themselves invisible and liked to hitchhike in a plane’s cargo hold, so that was how they traveled to England. Upon their arrival at Heathrow, Liam boarded a shuttle and told his friends to follow him. “Where are we going now?” asked Loughlin, who was always up for a good time. “I still don’t see why we have to make this bloody trip,” said Leary, his disposition as sunny as always. The leprechauns checked into their room at the Royal Crown Inn and Pub in Stoke-on-Trent. Leprechaun check-in is quite a different matter than check-in for humans. For the leprechaun, it simply means running up and down the halls of the inn, spying out the very best room, and waiting until the occupants leave. The leprechauns then stretch themselves out flatter than a crumpet and slide under the door. “Potteries? Why would we want to go there?” grumbled Leary. Some American tourists staying at the inn had arranged to visit the potteries, too. When Liam overheard the ladies talking, he and his friends decided to hop in the backseat of their SUV, in the tiny spots next to the pocketbooks, and hitch a ride. Once they arrived at the potteries, Liam was first to leap out of the car. “Follow me!” he said. Inside the first factory they toured, Liam and his friends peered around, wide-eyed, at the vast array of kilns and the teawares that had been produced there. Liam was quite the fan of Irish Breakfast tea and appreciated a good teacup. “So this is where it all begins!” said Loughlin, impressed. “What choice do I have?” said Leary. They entered a room where workers applied transfers to new china wares. Floral designs were the favorites in that room. Liam overheard a woman named Cathleen say they were busying filling the orders of Americans who wanted festive new teawares in time for St. Patrick’s Day. “Can’t say as I do,” said Gail, looking at her watch. She was ticking off the minutes until the next smoke break. “And what might that have been?” said the coworker, slightly interested. “How ’bout that,” said Gail, who thought that religious folk could be a pain in the bum sometimes. Just then, Liam told his friends of his extraordinary plan. “What a great plan!” said Loughlin. 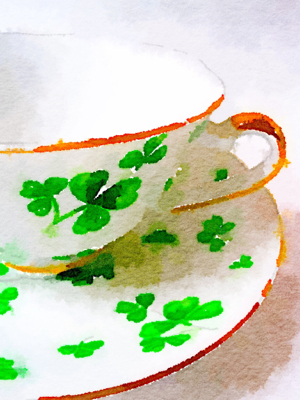 And so it was that while the pottery workers went on break one day, Liam and his friends disguised themselves as shamrocks and climbed onto a teacup, which a darling woman named Cathleen was absolutely delighted to find and ship off to the States. 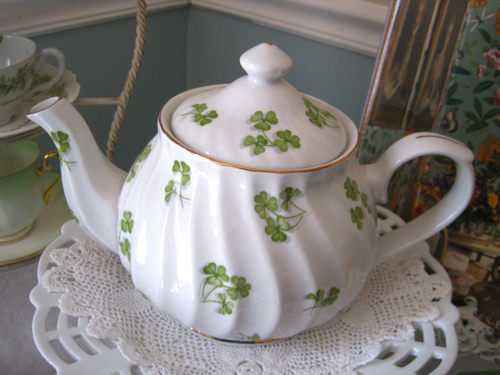 In America today, very early on the morning of every March 17, Liam and his friends depart their teacup home and run to their nearest Mass to pray and remember St. Patrick, dashing back well before the homeowner rises. That’s just an old legend, though, for leprechauns can’t turn themselves into shamrocks. Can they? Let's discuss Downton, shall we?